Salary Increase this 2017, free visa this June and now paid leaves credit. 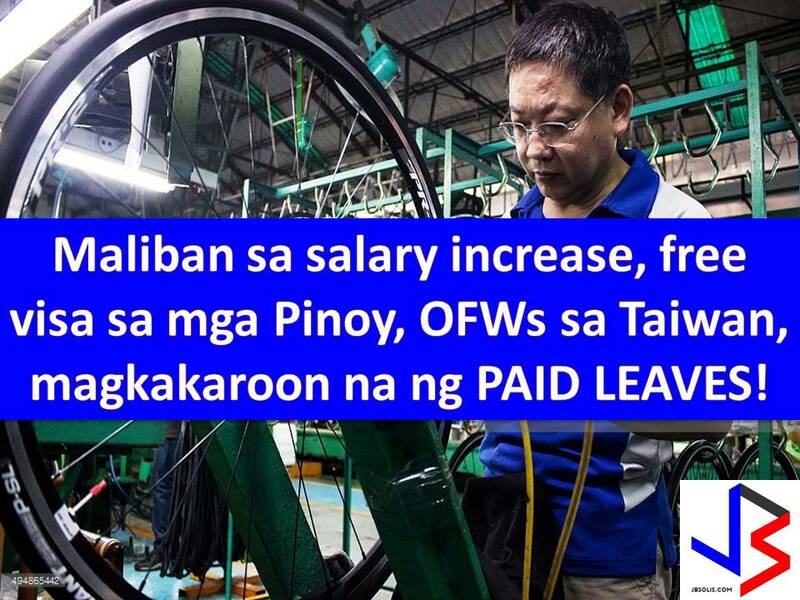 These are the new benefits Taiwan has given to their migrant workers which include Overseas Filipino Workers (OFWs). Manila Economic Cultural Office (MENO) announces that OFWs in Taiwan who have work for more than a year are now entitled to paid leaves credit. Also, under the new regulation, it stated that employers cannot refuse to grant paid vacation and certain other types of leave once the conditions are met. This is based on Labor Standard Law, the Labor Contract Law and the Act of Gender Equality in Employment, which now covers such workers. Fines of NT$60,000 to NT$300,000 ($1,974 to $9,870 or P98,196 to P490,983) and revocation of their permits to hire migrant workers are waiting for erring employers. In certain conditions that leave period is not achieved in urgent work situation even it is negotiated, the foreign worker has the right to obtain leave for the required period in accordance with the Taiwan Employment Service Act. “This new regulation is expected to greatly benefit the 130,000 Filipinos working in Taiwan but more so the families of our countrymen who now can have paid leave time spent with their loved ones," according to MECO Chairman Angelito T. Banayo who also expressed his thanks to Taiwanese government. "This is an added bonus after the MOL also granted to include foreign workers in the 5% minimum increase early this year.” he added. Most of OFWs work in Taiwan in factories and IT-related assembly companies. They comprise the third largest contingent of migrant workers in Taiwan. Last January a salary increase of 5 percent has been implemented to migrant workers in Taiwan including Filipinos while this coming June 1, 2017, Filipinos can go to Taiwan visa-free for up to 30 days. 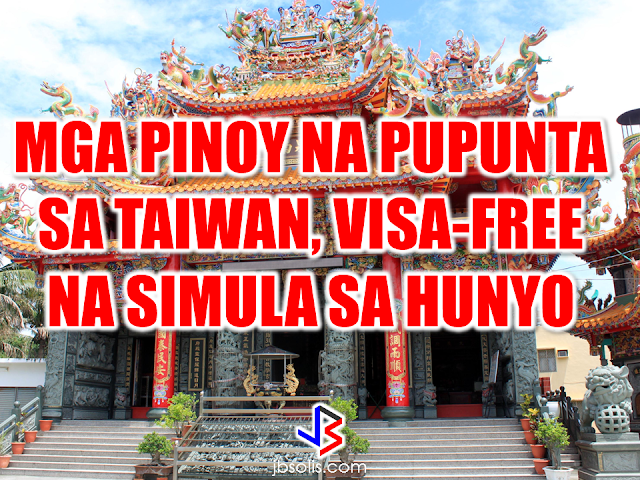 The Ministry of Foreign Affairs (MOFA) announced that Filipinos will be granted visa-free access to Taiwan starting on June 1, 2017. The visa exemption for Filipinos has a duration of up to 30 days, which will be implemented on a trial basis for a period of one year, from June 1, 2017 to July 31, 2018, the ministry said.The government also extended the 30-day visa exemption for Thai and Brunei nationals to one year. Starting January 2017, a wage increase of 5% will be given to OFWs working in Taiwan. 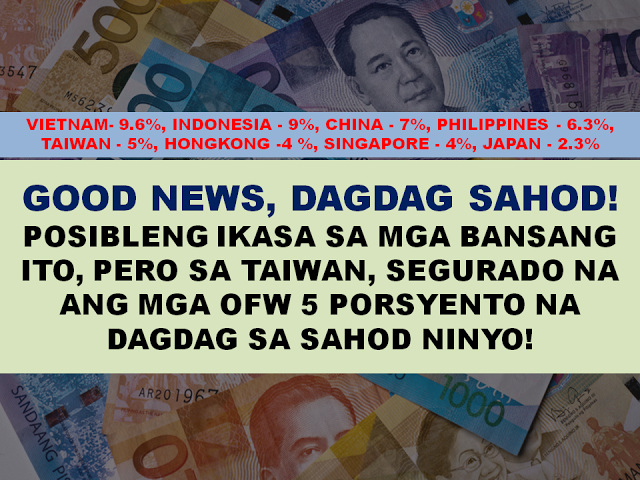 gOverseas Filipino workers (OFWs) in Taiwan will get 5.0 percent increase in their wages starting Jan. 1, 2017, an official of the country’s representative office in Taiwan said. Every OFW has a goal to be home for good for the shortest time as possible.According to Vince Rapisura, president of the Social Enterprise Development Partnership in Rappler's Article, OFWs should make a goal to come back home after a minimum of 10 years.